While implementing a successful motivational campaign, it is essential to understand that one of the most powerful drives in humans is self validation. The desire to be recognized and acknowledged for individual efforts and deeds on both personal and professional levels is the drive for higher performance and further achievements. However, when individuals are not praised or recognized for their efforts, productivity and performance fail along with the moral. There are many ways to implement corporate recognition campaigns which fall into two main categories tangible and intangible. The intangible way of recognizing an accomplished individual is verbal, by praising in private or public; also by promoting an individual to a different job title however without increase in pay. Intangible recognition is very important and should be implemented often, however it is short lived. The more successful way of recognition is with tangible goods and services. Some companies choose to execute service based programs such as travel getaways, dining certificates. Of course, increase in pay is also a tangible recognition and never goes un-noticed. Unfortunately pricy recognition options are not always in a budget. As a fairly inexpensive and very effective method, we recommend incorporating crystal awards into your corporate recognition programs. Crystal awards should be combined with a verbal or written recognition, thus solidifying the praise into something lasting and memorable. Crystal awards are elegant, refined and tasteful and have a high perceived value as appose to awards and plaques made of other materials such as wood, acrylic, resin or metal. 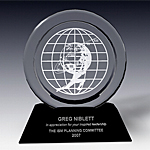 Crystal awards will help you convey the message of ultimate praise and appreciation. In addition crystal awards can be also combined or with other tangible recognition methods. For example, if an individual is rewarded with a promotion, then by presenting them with a crystal trophy or award, that they can later display at their place of work, you provide them with a constant reminder of self worth, pride and self satisfaction. Thus you promote further advancements in professional accomplishments, by constantly reminding them with an award of what they achieved so far. 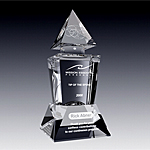 Our top selling crystal awards and trophies are from our own exclusive Everest line. 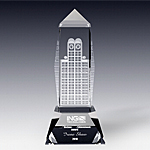 We cordially invite you to browse our Everest awards and discover how your corporate recognition program will benefit from our unique award designs.